As the obesity and diabetes epidemics progress, the search for causes and explanations becomes ever more urgent. Why, now, are so many people struggling with these diseases? There are many theories… I recently came across one interesting idea that appeals to my sense of possibilities, and it came from a 2012 paper entitled, "Comparison with ancestral diets suggests dense acellular carbohydrates promote an inflammatory microbiota, and may be the primary dietary cause of leptin resistance and obesity." Quite a mouthful. But author Ian Spreadbury makes a pretty simple and interesting point in this paper. The notion is that ancestral foods, (foods that humans have been eating for thousands of years), are not particularly dense with digestible carbohydrates, but many modern foods are. Maybe our body’s mechanism for managing carbohydrate calories is gradually overwhelmed by our modern low-fat diet, rich with foods that are very dense with carbohydrate calories. Could these modern foods be driving the twin obesity and diabetes epidemics? The low-fat diet, introduced and encouraged by our government in the late 70’s and early 80’s, pushed us away from some traditional foods (they asked us to decrease consumption of meat, animal fats, full-fat dairy, and eggs) and toward modern foods (they asked us to increase consumption of grains like bread, cereal, and pasta). And, since that is when these epidemics picked up speed, it seems like a point in time that deserves some scrutiny. 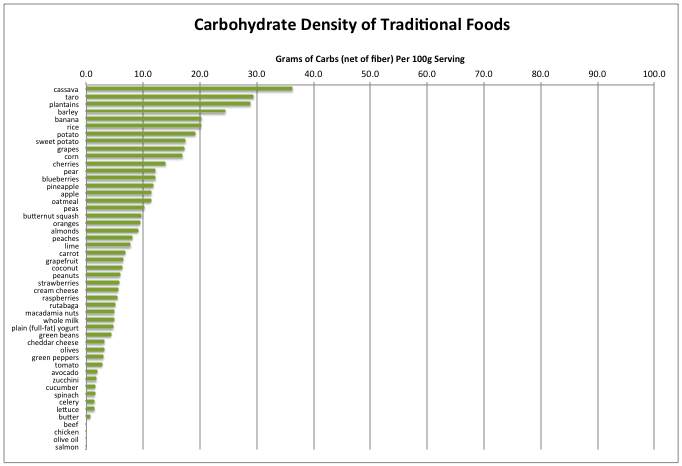 Although the author provides his own nifty graph in Figure 1 of his paper (scroll down a bit), let me offer a more colorful version of the carbohydrate density of various modern and ancestral foods. Note that the scale (0-100g) is the same in these two graphs... You will see that there is very little overlap. With the exception of cassava, taro, and plantains, ancestral foods are all less dense (from a carbohydrate perspective) than the modern creations listed. 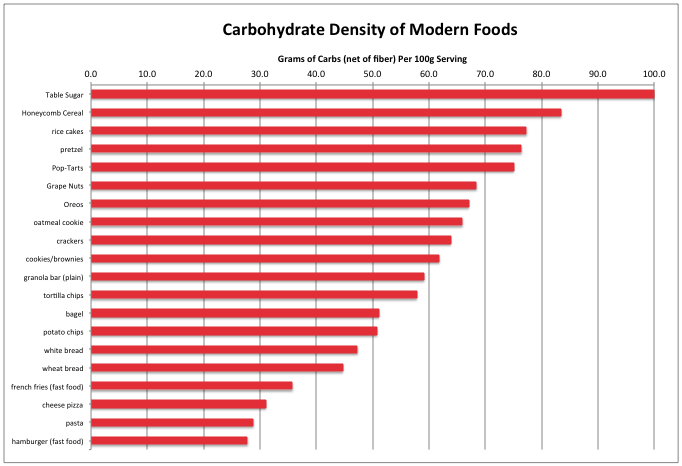 Are there modern creations that I left out that are lower in carbohydrate density? Yes. I cheated a little to make the graphs look better. For example, the mysterious creation, Kraft Free Singles (fake, fat-free cheese), has a carbohydrate density of only 11.5. Although low, this is more than triple the carbohydrate density of real cheddar cheese (3.1), so the pattern of higher carbohydrate density in modern foods is intact. Likewise, low-fat fruit yogurt scores 19.1 -- again, lower than most modern creations, but quadruple the carbohydrate density of plain full-fat yogurt (4.7). Of course, one of the reasons most of these modern foods score so high on this scale is that they are not a real, whole food full of fiber and/or water. So, might it help to drink a lot of water when chowing down on that granola bar? Maybe... it certainly could not hurt. Note, also, that it definitely does NOT help to wash the granola bar down with soda or Gatorade or Snapple or Red Bull or apple juice. Nor does it help to add a big glass of fresh-squeezed orange juice to your breakfast of Post Honeycomb cereal. VERY BAD IDEA. That would add to your body's carbohydrate load, now wouldn't it?